When Samuthira Raja, a corrupt politician tries to seize the villagers' land, Sura, a brave and powerful fisherman, sets out to fight against him. 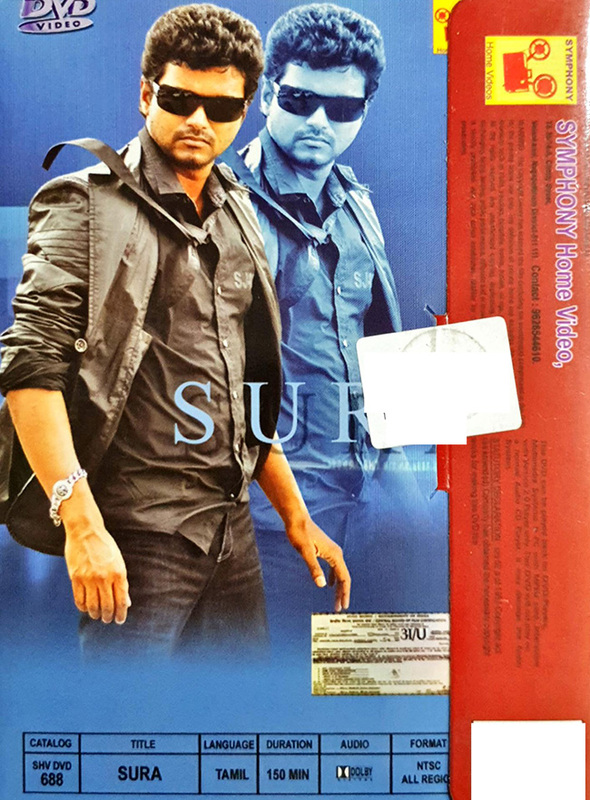 Please Note : This Sura movie DVD comes in a normal Paper Pack and not the Digi-pack/Keep case packaging. Sura (Vijay) was born and brought up in Yaazh Nagar, a fisherman hamlet in coastal Tamil Nadu, in the company of his friend Ambar La alias Umbrella (Vadivelu). Meanwhile, he comes across young bubbly Poornima (Tamannaah), who chooses to end her life, unable to cope up with the death of her pet dog. Poornima becomes attracted towards Sura thanks to his good deeds, and they start romancing. When things seem to go well, trouble enters in the form of a greedy and corrupt minister Samuthira Raja alias Sundaram (Dev Gill). He wants to usurp the land where these fishermen live, but his attempts to take away the wealth are resisted by Sura. They cross-fight each other. Sundaram hatches a conspiracy to bump off Sura with the help of his ministerial post and authority and sues him. Sura takes them on single-handedly and destroys his bad intention and helps his town fishermen get their own houses as he wished. However, Sundaram is plotting revenge against Sura for taking his money and because he lost that land in which he was about to build a fair. He plants a bomb, and Sura starts running when he sees Sundaram's henchmen. Sundaram caught him and said he planted a bomb in Sura's village. Sura said the chief guest is Sundaram's wife (Yuvarani), much to Sundaram's shock. Sura deactivates the bomb and kills Sundaram.